Alexandrina Victoria became Queen Victoria in 1837, when she was just 18 years old, and reigned over the British Empire for over 60 years. When her husband, Prince Albert, passed in 1861 the Queen never quite recovered from his death and dressed in black as a sign of mourning for the rest of her life. Here is Queen Victoria, dressed in her black finery and lace veil, with a backdrop of rich red and olive green. Only whole cross stitch is required to stitch this design, with a little backstitch need for the finer details. 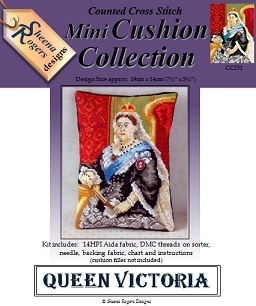 This mini cushion cross stitch kit includes: 14HPI white Aida fabric, ready-sorted DMC stranded cotton threads on a card sorter, needle, backing fabric, b&w symbol chart and full instructions (cushion filler not included). Design size: 7½" x 5½" (19cm x 14cm).